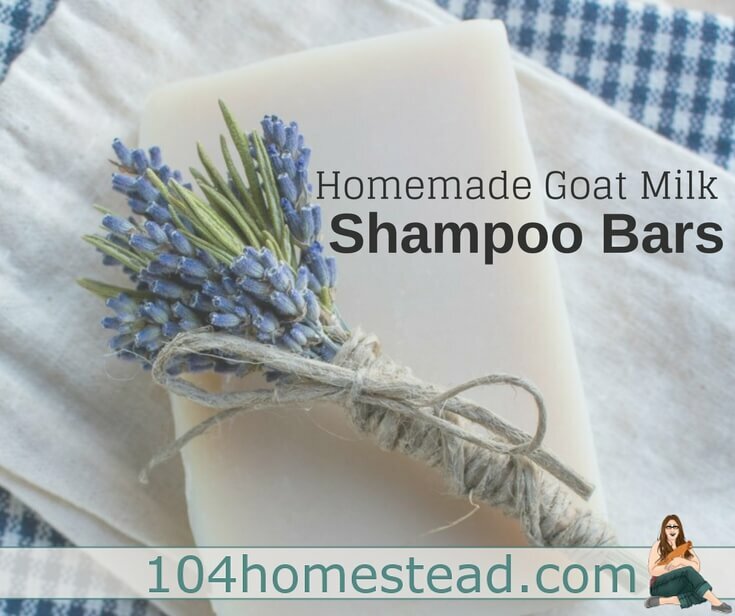 These goat milk shampoo bars have a generous helping of castor oil to promote a great lathering experience, along with a full amount of goat’s milk for an added creamy and luxurious feel. Shea (or mango) butter helps to slightly harden the finished bars while providing moisturizing properties for scalp and hair. This recipe is one from Jan Berry’s new book, Simple Natural Soapmaking. Before making, you’ll first need to freeze the milk. To do so, weigh the amount of milk you need for the recipe directly into ice cube trays. 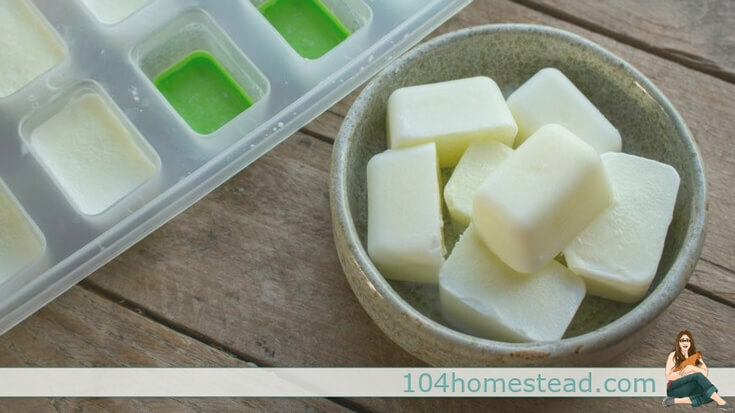 Freeze until solid and store the cubes in freezer bags until you’re ready to make soap. Note that all ingredients should be measured by weight. You’ll need an accurate scale to make soap. 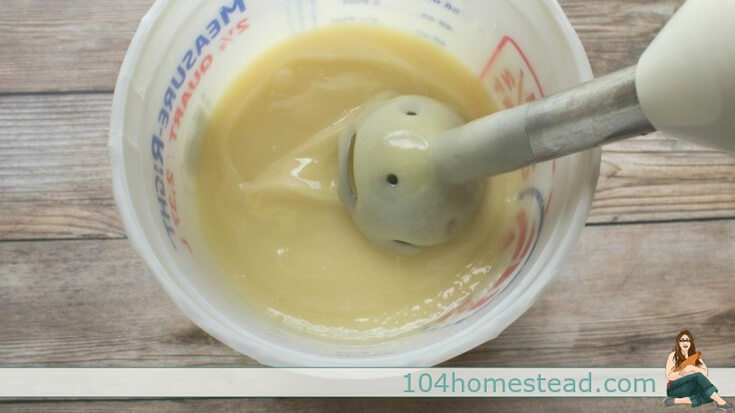 To replace the shea or mango butter, try using lard or tallow instead. The lye amount will stay within an acceptable range for either change and will not need to be adjusted. If allergic to coconut oil, try using an equal amount of babassu oil in its place. For this replacement, the lye amount should be slightly reduced, to 3.85 ounces (109 g). Place the frozen goat’s milk and water in a heavy-duty plastic or stainless steel bowl. Wearing protective gloves and eyewear, carefully sprinkle a small amount of lye at a time over the frozen milk, stirring well after each addition. The entire process will take several minutes, but working slowly ensures that the milk doesn’t scorch and that the lye completely dissolves. 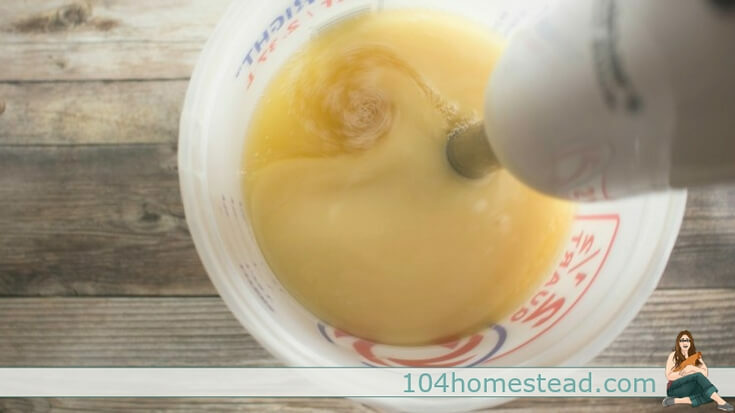 The lye solution does not need to cool further before adding to the oils. Melt the coconut oil and shea butter, then add to the other oils. Add the lye/milk solution to the oils. Using a combination of hand stirring and an immersion blender (stick blender), stir the soap until it reaches a very light trace. (Trace is when the soap has thickened enough so when you drizzle a small amount of the batter across the surface, it will leave a fleeting, but visible imprint or “trace” before sinking back in.) At trace, stir in essential oil, if using, then pour into a prepared mold. Jan Berry recommends the Crafter’s Choice Silicone Soap Mold. The proteins and fatty acids in goat milk shampoo bars nourish hair and makes it naturally shiny. If you have curls, goat’s milk shampoo will help to control frizz and make your curls sculpted. Also, because it’s gentle and it helps to moisturize the skin, you may find dandruff relief after using goat milk shampoo bars. If you’re looking for more great soap recipes, I highly recommend getting a copy of Simple Natural Soapmaking. Herbalist Jan Berry offers everything the modern-day enthusiast needs to make incredible botanical soaps. 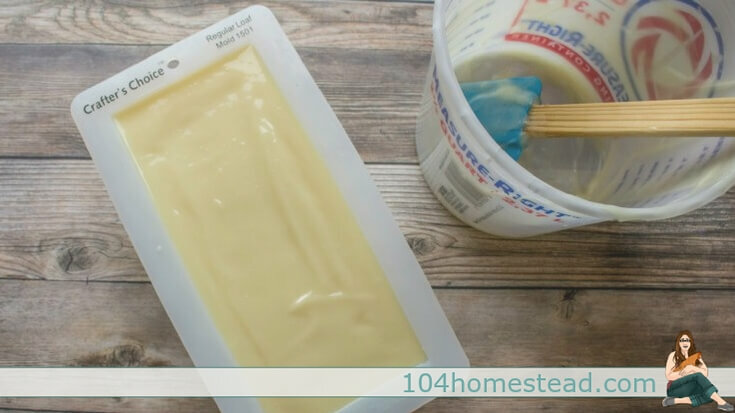 Beginners can join in the sudsy fun with detailed tutorials and step-by-step photographs for making traditional cold-process soap and the more modern hot-process method with a slow cooker. Jan presents fifty easy, unique soap recipes with ingredients and scents inspired by the herb garden, veggie garden, farm, forest and more. Is it possible to make soap without lye, or is it a necessary ingredient? 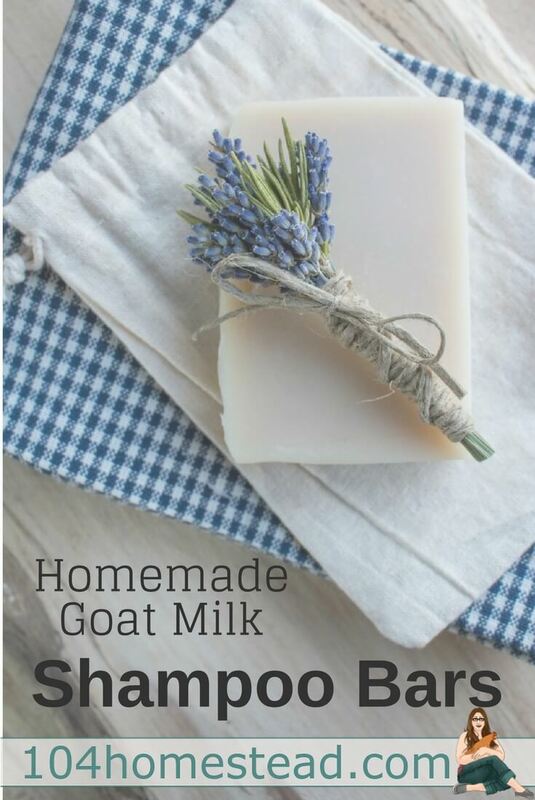 Hi, I am a high school student that is using this recipe for a soap-making project and I was wondering what size mold you used for this soap and at what temperature did you heat the mixture at the first step to melt the goats milk and water. Thank you! Lovely recipe. Hi. I know this comment is coming late, but I will answer anyway. You don’t heat the lye and goat milk/water mixture. You freeze the goat milk because when you add the lye to the goat milk (never the other way around), it heats up a lot because of the chemical reaction. It will scorching the milk easily if you don’t cool the milk. I would highly recommend starting with a recipe that doesn’t include milk, as that complicates things. Find a good book or more detailed instructions for making your first batch of soap. It’s not hard, but there are some things you do need to be careful about and it can seem complicated at first. Soap making is awesome. I’ve been doing it for about 6 years now. Best of luck!